HomeHealthThe Jonas Salk Polio Vaccine: A Medical Breakthrough or a Propaganda Campaign for Big Pharma? When polio (poliomyelitis) became an epidemic in the U.S. and other parts of the world many people were understandably concerned. Diseases are absolutely frightening. During the 1950’s, polio made the public fearful. In April of 1952, Dr. Salk announced at the University of Michigan that he had developed a vaccine against the polio virus. That same day, the U.S. government approved a license for the immediate distribution of the polio vaccine. By 1954 the U.S. government allowed national testing for the newly developed vaccine which Dr. Salk himself developed by growing a live polio virus in kidney tissues in Asian Rhesus monkeys. He used formaldehyde to kill the virus. Dr. Salk injected the vaccine into humans with a small amount of the actual virus into the body so it’s natural defenses can build immunity or a defense mechanism against the virus. The first experimentations on humans resulted in 60%-70% who did not develop the virus although 200 people were reported to have caught the disease, 11 of them died as a result. The cause was a faulty batch, but regardless of the outcome, vaccine tests continued unabated. One year after the result, four million vaccinations were given in the U.S. By April 12th, 1955, the Salk vaccine was licensed for distribution after the results were officially published. The release of the polio vaccine prompted criticism. In December 1960, a health news magazine called the ‘Herald of Health’ published a crucial report titled ‘The Great Salk Vaccine Fiasco: Misuse of statistics, blackout of vaccine cases, cited by eminent Chicago doctor’ By Ernest B. Zeisler, M.D. (which can be found at www.vaclib.org) who disagreed with Dr. Salk’s claims that the vaccine was safe or even useful against polio. Dr. Zeisler wrote a personal note to the publisher of the magazine M. S. Arnoni and told him that “No newspaper, periodical or medical journal will touch this. Many authorities in this field agree with me, and some have written me to say so and to congratulate me for what they call my ‘courage.’But no medical man will agree with me publicly”. Adolf Hitler was once quoted as saying if you “Make the lie big, make it simple, keep saying it, and eventually they will believe it.” More than 98 million people were given the polio vaccine through a well-crafted propaganda campaign committed by medical professionals aligned with Merck & Co. and others in the medical establishment and of course, the U.S. government. In today’s market, the Flu vaccine (High Dose) for people over 65 years old costs $54.99 per dose and the MMR (Measles, Mumps, and Rubella) vaccine costs on average $99.99 according to a Walgreen’s price list. Now imagine the total U.S. population as of 2015 stands at over 300 million. If you do the math, pharmaceutical corporations will reap billions of dollars in profits. The mainstream media (MSM) continues to push all types of prescription drugs and various types of vaccines to the public even during commercials. The U.S. and New Zealand are the only two countries in the world that advertises prescription drugs and vaccines to the public. Legal drugs is a lucrative business, you can even say dangerous especially when big pharmaceutical corporations, the media and elected officials in Washington collaborate on foreign and domestic policies regarding health as a national security issue. 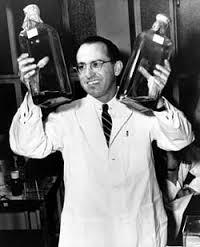 Dr. Jonas Salk became a legend in the field of medicine in the U.S. and the world. There is the Salk Institute for Biological Studies in La Jolla, San Diego, California, you have Salk scholarships awarded to students every year, the City College of New York (CCNY) and Salk’s “alma Mater” celebrates his accomplishments. In 2014, CCNY stated that it will “honor polio vaccine pioneer’s 100th birthday with symposium on disease he helped defeat.” They even established the Polio Hall of Fame, Yet the failures of the polio vaccines are ignored by the MSM, the U.S. government and the medical establishment. In this case, propaganda for the polio vaccine has won the battle for “Big Pharma” profits, but the war for our health will be won in the end by the people who do not trust any sort of corporate sponsored drugs or vaccines even when old and new diseases occur. There are better ways to fight diseases, perhaps with a focus on ’Prevention’ rather than to depend on drugs that are produced for the sole purpose of profits. 2 Comments on The Jonas Salk Polio Vaccine: A Medical Breakthrough or a Propaganda Campaign for Big Pharma? Chiropractors are quacks. Not a shred of real science to support their quackery. Spend your money on magic beans. You’ll get the same result. Real scientists and medical professionals know the value of vaccination. The quacks don’t have the requisite education to understand real science.